This monster from the deep has netted a British angler a place in the record books. 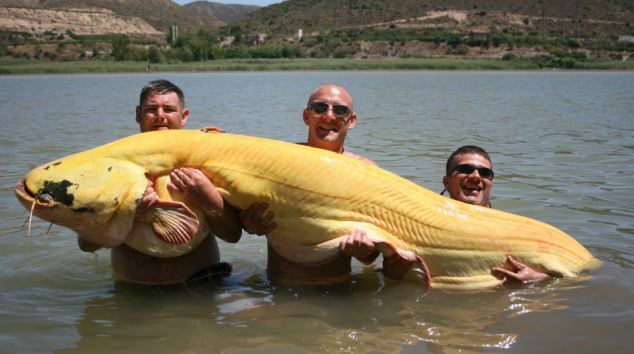 The whopper, caught by plucky Chris Grimmer, is the biggest albino catfish ever caught by an angler. The 8ft beast tipped the scales at 194lbs - 2lbs heavier than the previous best by blind woman angler Shelia Penfold last year. Chris, a 35-year-old ground worker, spent 30 minutes trying to reel in the white catfish after it took his bait. Chris, from Sheffield, toasted the record catch with a bottle of champagne which he and his friends drank on the river bank. He and three pals had been on a week's fishing trip to the River Ebro, near Barcelona, Spain, when he snared the record catfish. The fish was so big that Chris' rod bent over double when it took his bait of halibut pellets. He said: 'It took my reel and stripped it and it was then that I knew it was a big one. 'At that moment our tour guide had popped off to get some food and one of us phoned to tell him and he couldn't get back quick enough. 'It took me ages to bring it in, it was like trying to reel in a bus. 'One of my mates went into the water to help lift it out. 'By that time the guide had come back and he got it in the weigh sling. 'I was jumping down the bank when I realised it was a record and ended up in the water. The albino fish was returned to the water safe and well after being caught. Ashley Scott, the guide from Catmaster Tours who organised the trip, said: 'We know what the records are for catfish so we realised straight away that it was a record. 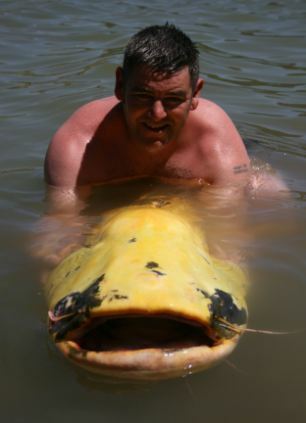 Sheila Penfold, from Wandsworth, South London, caught her 192lb albino catfish last October. The biggest catfish ever caught in the world is a staggering 646lb - or 46 stone - Giant Mekong Catfish caught in Thailand in 2005.